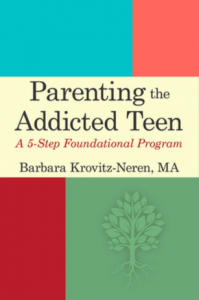 The Book – Competent Parents, Confident Kids, Inc.
“Parenting the Addicted Teen, A 5 Step Foundational Program,” is the culmination of Barbara Neren’s life work. She teaches parents 5 powerful strategies that will help them reclaim their parenting from addiction and mental health challenges of their teens or young adults. Parents are taught to detach and not abandon their children and are taught how to manage recovery for themselves, and their families. This book is also a great resource for clinicians who work with parents and families.